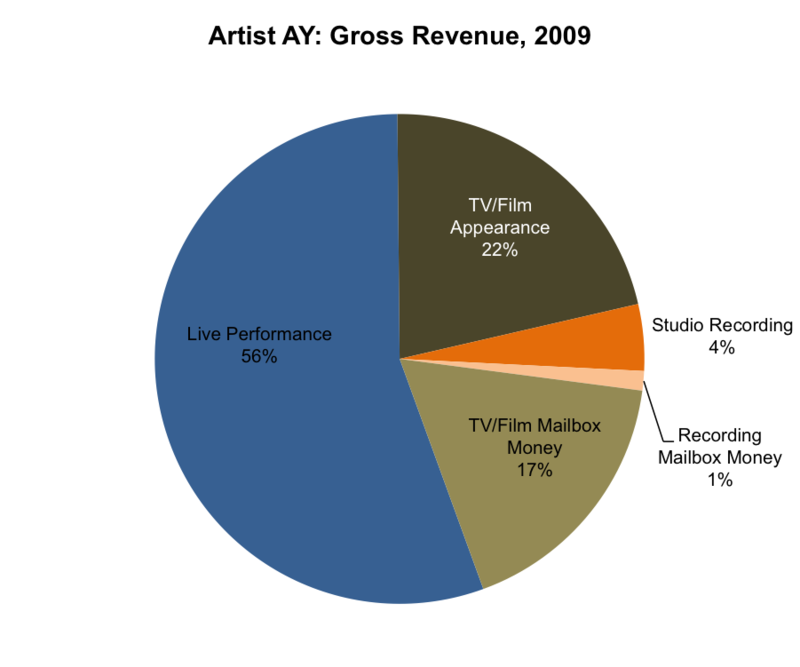 This page provides a detailed look at the Background Vocalist’s gross income for each year from 2009-2010. In 2009, this Background Vocalist performed as a live background vocalist on many performances with mostly one featured artist, and also appeared as a live background vocalist at a few other events. As a salaried crew member, she taped episodes of her current primary TV show. Since her primary TV show is popular, she also received new use fees for taping episodes of a related spin-off talent show that uses footage from the primary show. This Background Vocalist also received fees for performing on studio soundtrack recordings of her primary TV show. She received TV mailbox money for two previous seasons of her current primary show, from her previous primary television show (on which she appeared on numerous episodes over six seasons in the late 90s-early 00s) as well as from other television appearances. Most of this mailbox money was for domestic syndication and foreign use. She also received recording mailbox money from studio recording credits with seven artists from recordings released from 1998-2002; all were recorded under a SAG-AFTRA contract. This Background Vocalist appeared on three recordings that came out in 2009. Two of these were soundtrack collections related to her current and previous television work. One was a greatest hits compilation of songs recorded with a featured artist years previously. All were released on major labels. Only one of these was recorded in 2009; the others were recorded in previous years. Session Musician in Studio 4.4% Fees for recording sessions associated with current primary show for 1 audio major label release. In 2010, this Background Vocalist performed as a live background vocalist on many dates with one featured artist, and also appeared as a live background vocalist at one other event. She taped a season’s worth of episodes of her current primary TV show as a salaried background vocalist, and received new use fees for one episode of the spin-off show that uses footage shot from the primary TV show. As in 2009, she received fees for recording studio versions of songs from her current show. She received TV mailbox money for a previous season of her current primary show, multiple seasons of its related spin-off show, as well as mailbox money from her previous primary television show (on which she appeared on 41 episodes over six seasons in the late 90s-early 00s) as well as from multiple other television appearances. Most of this mailbox money was for domestic syndication and foreign use, though she received a significant amount of money from a ringtone royalties settlement that was paid out in 2010 as well. This Background Vocalist also received recording mailbox money via the AFM & SAG-AFTRA Fund from recording credits with seven artists. The Background Vocalist appeared on one recorded soundtrack of her television work that was released on a major label in 2010. The other record released in 2010 was an urban record released on an independent label where she was an arranger and background vocalist. 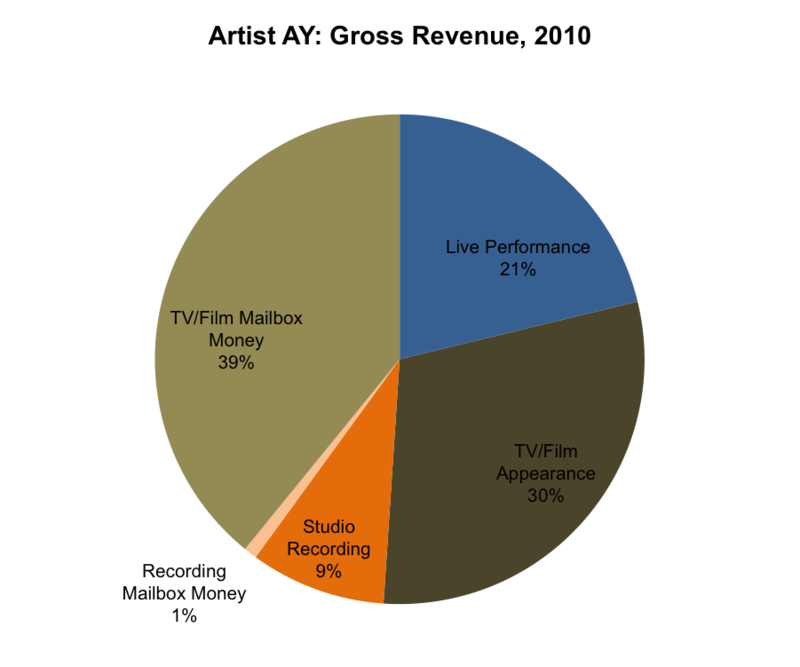 Recording Mailbox Money 0.9% AFM & SAG-AFTRA Fund income for multiple recording credits with 7 artists. Records were released in 1998-2002 and 2008.